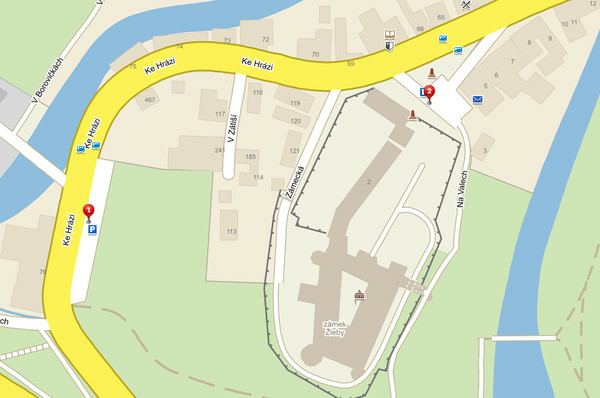 There are two parking lots in close vicinity of the castle grounds. The train station is about a 15-minute walk away . The bus stop is located on the square directly below the castle. Žleby is about one hour from Prague and 20 minutes from Kutna Hora, and 40 minutes from Pardubice. Bicycle racks are located in the area of in front of the chateau. In front of the chateau (near the cash desk) is a kiosk with snacks. The usual assortment of- soda, coffee, beer, hotdogs, confectionery, ice-creams. One restaurant is in close vicinity of the chateau grounds.